Replacement rocker switches for each function Headlight - Fan - Courtesy - Auxiliary 1973 / 74 Wiper and Washer Switches > Built-in relays with high current contacts for low temperature long life operation. > Rugged construction, bezel is aluminum, internals are fiberglass and brass, will not melt like after-market switches. > These replacement rocker switches fit in the factory mounting holes. 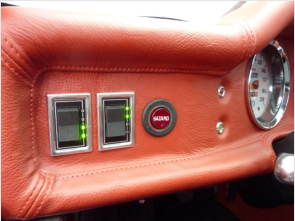 (some console panels may need material removed from the corners) > Internal lighting for night illumination and brightness is controlled by the factory dimmer. > Replacement rocker switches connect to the factory wire harness without modification. (additional wire needed for lighting) > Fan rocker switch has 20 incremental speeds which can be selected one at a time or rapid slew from off to maximum speed. > Fan rocker switch has a bargraph to indicate speed in 25% increments of maximum speed. > Headlight switch has delay “OFF” for walk-away and remote control input for key fob operation. 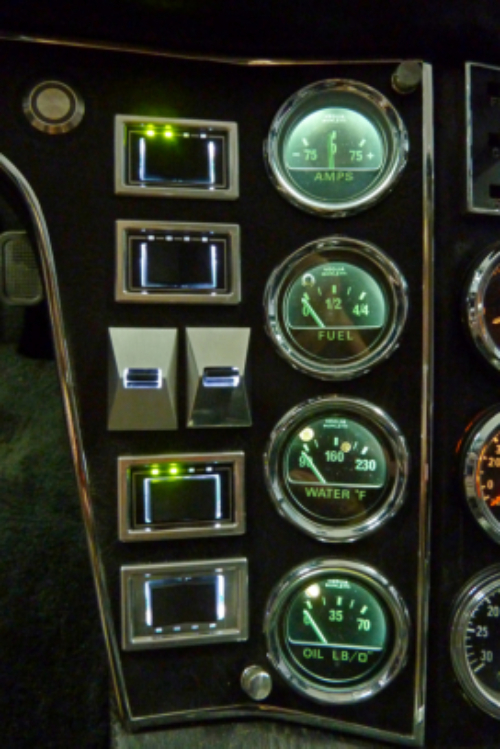 > Indicators for switch position and function. > Removable aluminum bezel that can be finished for many styles and personal preference, polished, painted, anodized. Bargraph indicator for percent of fan speed, 20 fan speeds ! Decrement fan speed , one step per press, or press and hold for rapid decrease in speed. Increment fan speed, one step per press, or press and hold for rapid increase in speed. 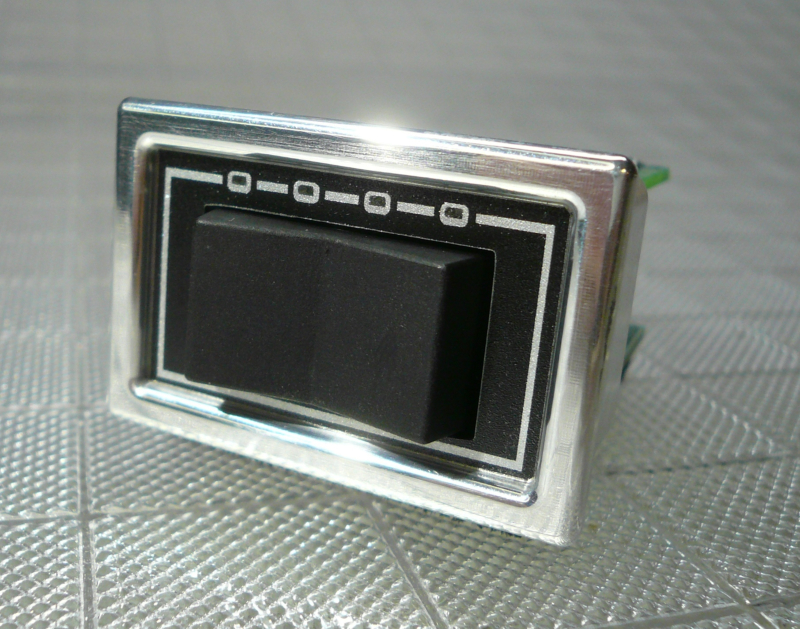 This rocker switch bezel was finished like the factory rocker switches. Rocker switch bezels can be removed for any kind of finishing. All rocker switches have function indicators and night illumination. The Fan switch with a progressive bargraph for speed indication. Can be used with factory fan or any after-market multi-speed fan. Does NOT use the power wasting resistors, returns un-used power to the battery. 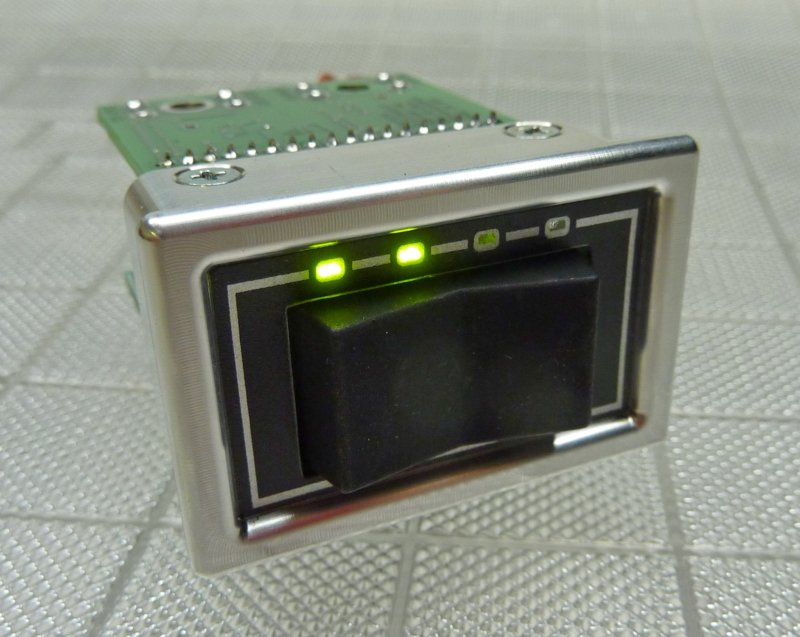 HEADLIGHT SWITCH with status indicators for parking lights and headlights. No other supplier has this warranty on switches! WINDSHIELD WIPER ROCKER SWITCH 2 speed for wiper switch with adjustable speed preset for the low speed. WINDSHIELD WASHER ROCKER SWITCH 2 types of spray operation Constant spray - sprays as long as the rocker is pressed. Pulsed spray - Sprays 3 times and pauses after each spray for wipers to scrub solvent. Then automatically stops. Activating either type of spray automatically activates the wipers in low speed and stops.